A constant topic in most political discussions is the state of the U.S. economy. It is something America is constantly analyzing by comparing internationally with other countries as well as domestically. 7 years after the recession the economy has somewhat rebounded, but we are still recovering. By analyzing different aspects of America’s performance in international trading and the working wages of Americans we begin to get a grasp on status of the economy and begin to understand where we need improvement. One of the most useful economic statistic available for measuring the economy is the GDP. The Gross Domestic Product, or GDP, measures the total dollar value of all goods and services produced by the U.S. This data averages all the prices in a specific year and gauges America’s Purchasing Power. The GDP is used by the White House and Congress for the preparation of the federal budget. When the GDP is high it is typical to see a decrease in unemployment as well as an increase in wages. However, when the GDP is low that means the economy is producing lower profits which could translate into lower stock prices. In Q2 of 2016 the GDP, showed an increase of 1.2%. The chart below shows that the GDP is actually in decline when compared with 2016. 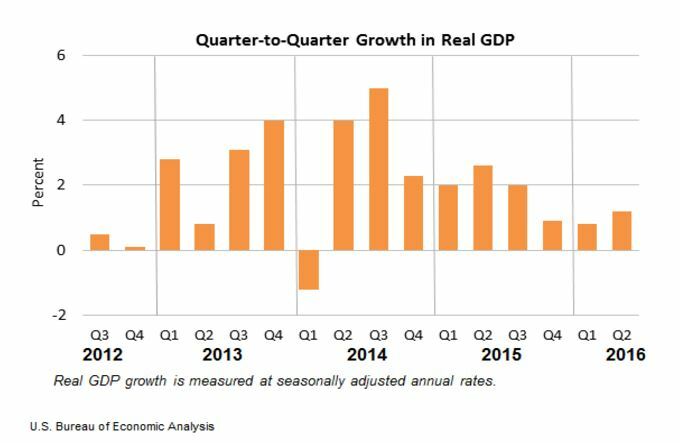 While there is an increase of 1.2% in Q2 of 2016, the U.S. the GDP has decreased over the past year. 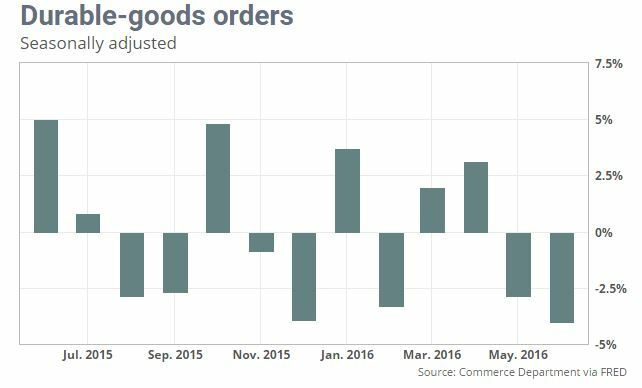 The chart below (1.A) shows that in the month of June the US new orders of durable goods went down 4% which calculates to 9.3 Billion loss. Durable goods are classified as items that are meant to last for three years or more. The largest decrease from durable goods came from computers (-19.1%) and nondefense aircrafts and parts (-11.8%). The chart below (1.B), provided by Lloydslist.com, shows that the month of January was the lowest point in 30 years for Baltic Dry Index (BDI). The BDI is analyzes the cost of shipping dry goods internationally for trade. When the BDI is low the demand for raw goods and materials is decreasing, but when the BDI is rising the economy is expanding due to the sales of raw materials. While the sale of durable goods and the status of the BDI is a measure of international economy it does give us a glance at the status of America situation in international trading. Increasing the amount of goods the U.S. sells abroad creates more high paying jobs. With the presidential elections heating up both Donald Trump and Hillary Clinton have outlined their economic reform strategy. Both are fighting for different strategies that they believe will help America’s economy. At the heart of Donald Trump’s economic reform is tax simplification and a middle class tax reduction. Trump will also completely eliminate the Carried Interest Deduction loophole, a tax break that hedge funds use on incentive fees to receive more capitol, which many have taken advantage of. He will also halve the number of income brackets from 7 to 3 while reducing the rates for many Americans to 12%, 25%, and 33% while giving the poorest Americans a zero tax rate. By lowering business taxes to 15% Trump hopes to reinvigorate American manufacturing to create jobs and increase products that are made in the U.S.
Hillary Clinton has other ideas when it comes to her economic reform. Hillary wants to lower taxes for small business, stating that small business with one to five employees will spend on average $1,100 per employee on federal taxes. She would also implement an “Exit tax” which would tax multinational companies who leave the U.S. to collect earnings in foreign countries. A “fair share surcharge” which will implement a 4% income tax on those making more than 5 Million a year. Hillary has also been very vocal in her fight to eliminate gender inequality in the work place with equal pay for women. While both candidates disagree on multiple economic reforms Hillary and Donald seem to have common ground on minimum wage. Trump agrees with raising wages but ultimately believes that more importance should be put on the states minimum wage and not the federal. That because the cost of living and prices of goods fluctuate depending on the state, so should the minimum wage. Using the city of New York Trump argues “You can’t buy a hot dog for the money you’re talking about ($10). You go to other states and it’s not expensive at all”. Even though salaries are higher in New York to balance the price of living someone moving from Topeka, Kansas to Manhattan would expect to see a 28% increase in groceries and a 479% in housing. On the other side Republican Nominee Hillary Clinton has argued the federal minimum wage should be at least $12 and in some instances has supported a $15 living wage. Hillary like Trump agrees that state governments should be in the conversation for increasing minimum wage. Since 2013 President Obama has been fighting for a $10.10 federal minimum wage, which has not been approved by federal law but has been adopted by over 40 cities and localities. The Department of Labor states that “since 1938, the federal minimum wage has increased 22 times. For more than 75 years, real GDP per capita has steadily increased, even when the minimum wage has been raised.” Increasing wages could also have a positive impact on unemployment. The US Department of Labor also states that “academic research also has shown that higher wages sharply reduce employee turnover which can reduce employment and training costs”. With only a small increase in prices due to inflation of the minimum wage, this tactic could be a good way to help strengthen the economy but would do little to help those under the poverty line as some poor families are already living of wages higher than $10.10. In some cases efficiently tracking the status of the US economy is just as difficult as creating strategies to improve it. There are declines present in the new orders of durable goods and the Baltic Dry Index, but we are seeing an increase in GDP. The federal law to raise minimum wage has been stagnant even though change from new presidential candidates may be on the horizon. When you look at the data there is evidence that the economy is still weak. However, this is a problem that is constantly on the minds of the American public. There are always opportunities to grow, hopefully our economy will do just that in the very near future.